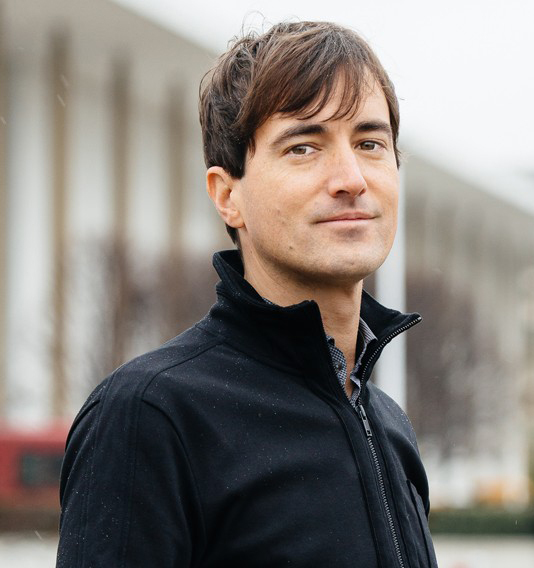 In June of 2009, Mason Bates became one of MA’s first New Artists of the Month; in December of 2018, he was named Musical America’s Composer of the Year. So it’s safe to say that this San Francisco-based composer, now among the most performed of the 21st century, has come full circle. He’s still known for his successful fusion of electronics with acoustic instruments, and it’s not uncommon to see Bates himself seated at his laptop among the woodwinds for his orchestral pieces. His first opera, The (R)evolution of Steve Jobs, with librettist Mark Campbell, bowed with success last summer at the Santa Fe Opera and is next scheduled to be mounted by the Seattle Opera in February and March of 2019. He’s been busy with commissions, adding to an already substantial catalog of symphonic, vocal, and chamber works, not to mention film scores. Bates, former composer-in-residence with the Chicago Symphony under Riccardo Muti, currently holds that title with the Kennedy Center—its first—where he works with a number of different programs, from the National Symphony Orchestra to Kennedy Center Jazz to the new KC Jukebox series, which is helping to connect the Center to new and younger audiences. Highlights in the current season have included a performance by the NSO of his Auditorium, a “neo-Baroque” work for period instruments originally premiered by the San Francisco Symphony (host of the 2014 “Beethoven and Bates” festival), and the premiere by the Richmond Symphony of his first work for chorus and orchestra, Children of Adam, a setting of American poems about creation, by mostly secular poets. The Chanticleer chorus has been touring the U.S. with his new Drum Taps, in a program designed to respond to armed conflict. The Joffrey Ballet premieres a new ballet on his The B-Sides, with choreography by Nicholas Blanc, while the English National Ballet reprises his Anthology of Fantastic Zoology, choreographed by Aszure Barton.